Palma de Mallorca, April 21, 2012. 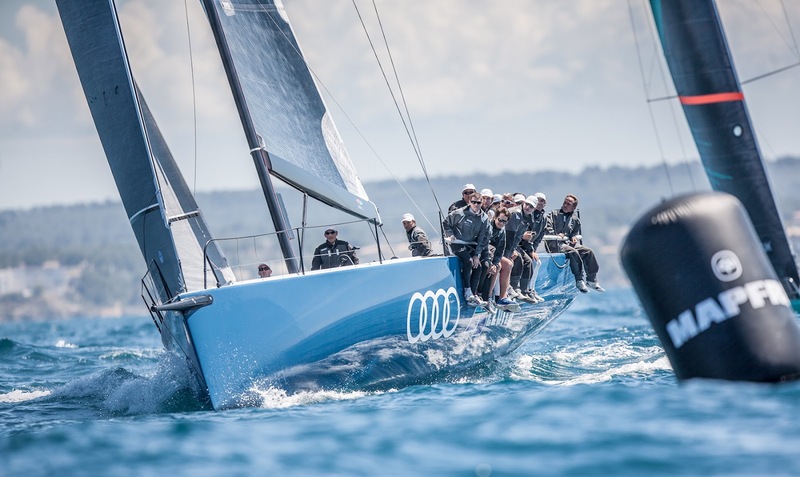 Three bullets in today's light sou'westerly wind for Audi Azzurra sees Alberto Roemmers and crew extend their lead in the TP52 division of the Mapfre PalmaVela, as does Iberdrola in the Soto 40 class. 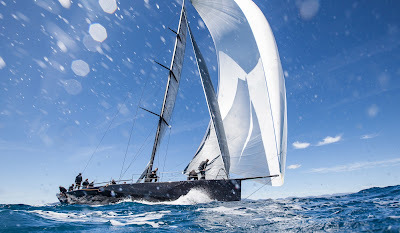 The Maxi class's coastal race brings another win for Jethou. 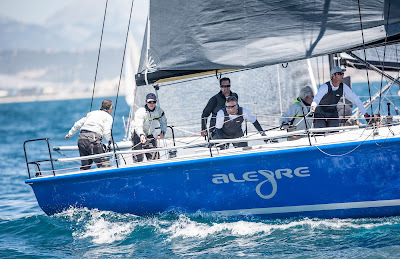 A third day of racing for the 115 boats registered in this seventh edition of the Mapfre PalmaVela featured a coastal race for the Maxi and Vintage and Classic divisions, whereas the rest of the fleets run windward-leeward races inside in the world renown bay of Palma. 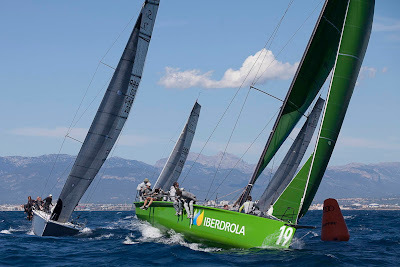 Southerly winds of 8 to 10 knots in the early afternoon cooperated to give almost all classes three races, although the breeze didn't settle until later in the afternoon, 15:00 hours, when the clear sunny skies and 15 knots delivered picture-perfect conditions. Alberto Roemmers owned and skippered Audi Azzurra had a smoking hot day with three bullets in three races, thus climbing up to first three points ahead of Ed Baird skippered Quantum Racing. 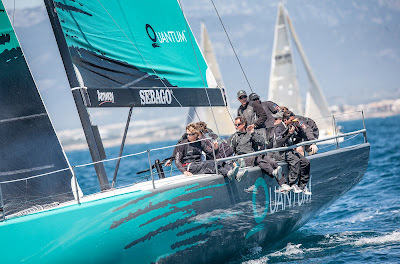 The USA flagged TP52 loses the lead to the Italo-Argentinians after two second and one third place finishes, whereas RÁN of Niklas Zennström didn't have her best day and posted two fourth places and a second, but still holds on to the third position. The Maxi and Vintage and Classic divisions had their coastal races today, 33,3 and 12,8 miles long respectively, inside the bay and round the Isle of Sec, a classic long course for the regattas held in the waters of Palma. Maxi Jethou added another win to her score what keeps them on top of the board, followed by Magic Carpet 2 of Sir Lindsay Owen-Jones, and third is German Emma of Dr. Johann Killinger. 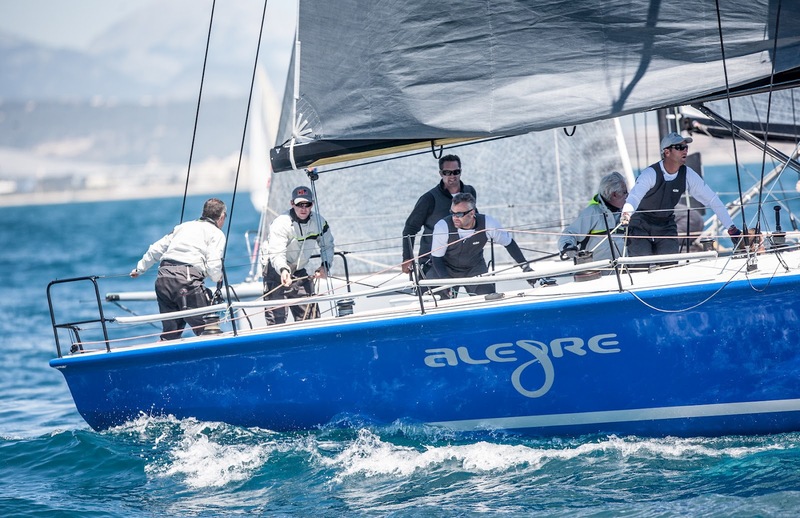 In the J80 class Javier Sanz's Pro-Rigging skippered by David Madrazo clawed their way up to first after a great performance notching two first and a second place, leaving Jose María Van der Ploeg's Nilfisk as runner up. The Spanish Olympic medallist posted a sixth, an eleventh - discarded- and a first. It was almost a solo race for Iberdrola today, with three bullets in as many races what helps them extend their lead to five points over Andrés Soriano Iberdrola with Olly Cameron at the helm, which posted three third place finishes. Third is English Ngoni of Tony Buckingham which was fifth in the first race but improved as the wind picked up posting two third finishes in the two last races.